The “Family Getaway Package” is available for booking until 30th June 2017 for stays between 1st June – 31st August 2017. 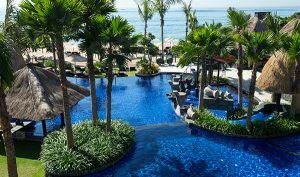 Holiday Inn Resort Bali Benoa offers 171 rooms and suites with a variety of accommodatio​n options that will be suitable for every family size and budget. The resort is wonderfully located in the southern part of Bali Island and surrounded by golden sandy beaches, also providing facilities to make the guest stay comfortable, starting from swimming pool at beachfront, Tea Tree Spa, all day dining Pasar Market Café, Duke’s Pool Bar & Lounge, Nudi Beach Bar & Restaurant, Resort Center and Kids Club. For more information, terms & conditions* and reservations, please call (+62) 361 894 7888 or email reservation.benoa@ihg.com.